Client Software International has recognised the enormous growth in the use of browser technology and released WinComExplorer which allows access to host data by opening a terminal session through the browser. This is a further step in our plan to provide products that assist users to implement an intranet strategy. As with our previous product developments the availability of WinComExplorer as a crossgrade from existing products preserves the customer's investment in Client Software products. All the functionality available in WinCom2000 has been incorporated into WinComExplorer enabling a smooth implementation of this new product. Existing users of WinCom2000 will continue to be offered version upgrades as they become available. This is achieved by simply selecting a service name from the Favourites list or clicking on an icon on the desktop. The Internet Explorer toolbar is replaced by a special emulation toolbar that can be floating or docked in a variety of positions. WinComExplorer provides an Internet Explorer Profile for users who want to use the Microsoft Internet Explorer browser to connect to host applications. The second option is a MS Windows Profile which allows WinComExplorer to operate without the use of a browser. 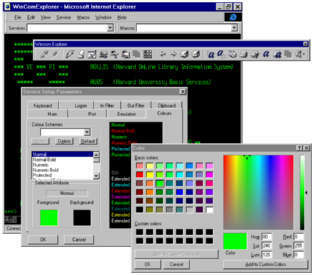 The above screen shot shows the floating toolbar and font colour selection using the Microsoft Windows colour selector. The text below each item on the toolbar can be toggled on or off and the toolbar can be customised using the drag and drop toolbar editor. A customisable virtual keypad can also be floating, docked or hidden. This screen shot shows the Macro editor and graphical keyboard remapping tool.The graphical Macro editor provides simultaneous access to multiple Macros for cut and paste editing between Macro functions. Keyboard remapping can be performed using a simple drag and drop operation. An integrated keyboard reporting tool summarises the key top mappings that have been selected. Keyboard templates for all supported emulations are included with WinComExplorer.